Love the pants I got tons of compliments when I wore them the other day, I usually wear a 6, but had to size up on these. I have worn them with and without the belt. They look good both ways. I love these pants. They're ankle length, have back pockets, you can wear it with different belts for more versatility, and the straight leg shape is really in-trend. Would highly recommend! Love the high waist on these pants and the flattering fit. I did have to exchange for a larger size, though, as I found they fit small. Was a little disappointed to discover that the hemming was uneven between the pant legs, so they get four stars instead of five. Beautiful pant but I had to return them. I am regularly an 8 in Aritzia pants (eg Conan) but even at a 10 these were snug in the waist and too baggy in the legs. Probably good for a less curvy body type! My favourite pants! I have them in Black and Nutmeg. The most gorgeous material and they fit beautifully. For reference, I am a 26/27 in pants and the size 4 fits TTS. They do look best with heels, but fancy flats work too. P.S. 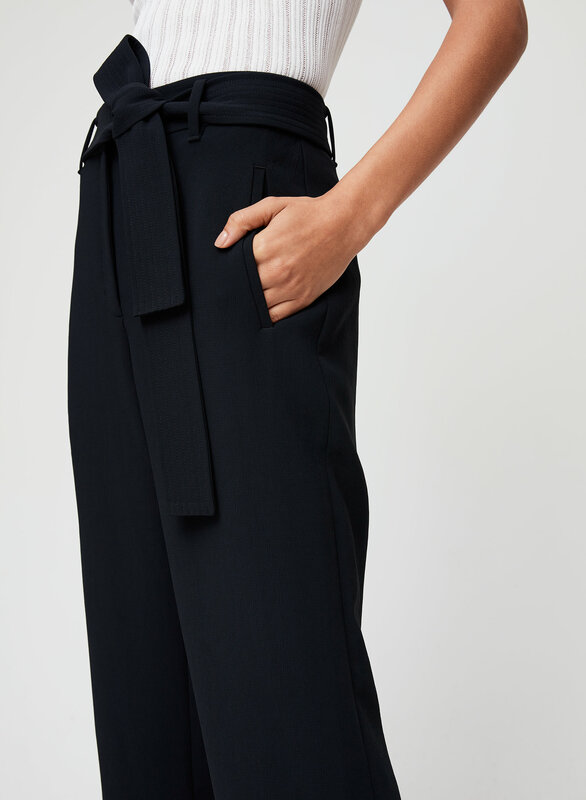 Aritzia, why the name change from Jallade Pant to Tie-Front Pant?! It sounded way better before! I own 3 pairs of these pants and I love them but the sizing is extremely inconsistent. When they first came out I purchased a size 2 to have extra length but I could have worn a 0 which is my usually size. I later picked up another pair in a size 2, different color and they fit smaller than the 0. I then ordered the red and to be safe got a 4 which fits nice and lose. Now I ordered the pink color in a 4 and they fit smaller than the size 2's I have. For reference I am a 25 waist , 115lbs. 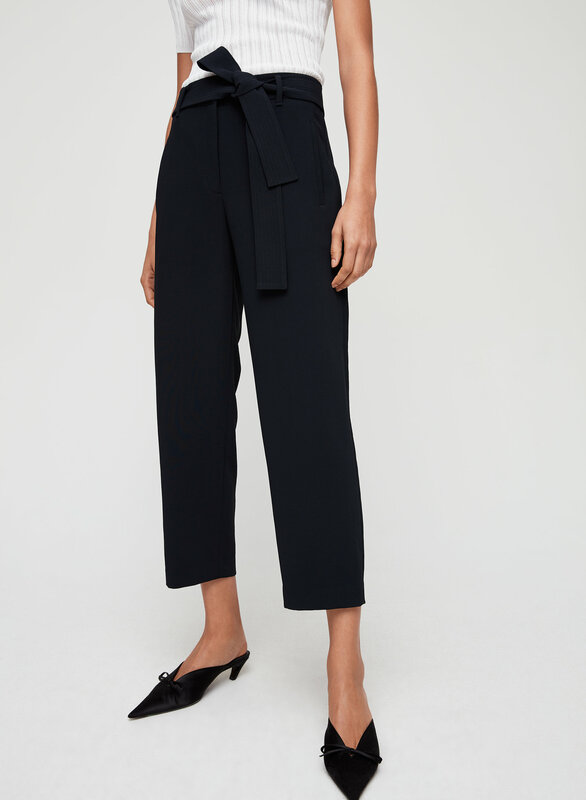 Please fix this sizing issue Aritzia because these pants are amazing but I cant give them 5 starts because the sizing is ridic! Got a pair of these pants when they were on sale for about half price! So comfy and I've gotten so many compliments. Can't wait to get another pair! I have 6 pairs of these pants in different colors. And I have another 2 pairs on my wish list. These are high waist pants, so if you have a little bit of belly, then you may want to size it up. However, to those with flat stomach, these are true to size. I am 164cm, and these are cropped pants to my height. If you are taller, you might want to look at their long pants product line. The material is just perfect for business or casual. It does not get wrinkled at all. Hope Aritzia will never discontinue these pants. Ordered one size up as per the reviews, and shouldn't have. Fit is much too large on the waist, it falls down. Normal size would have fit perfectly. have to size up 1 or even 2 sizes. The pink isn't flattering at all. Have to wear heels to make it decent looking, otherwise it makes the legs look short and chubby and adds 10 pounds. Black is definitely better. I'm a size 4 in almost everything but definitely needed to size up in these pants. ordered them online (gamble, since they didn't have any in size 6 at the store I was at) but they fit PERFECTLY. They're made of a great, high-quality feeling material. Can't wait to style them! I wore these pants to work and got so many compliments. I love the fabric and the belt. I bought a size 0 and the pant leg fit nicely and loosely, but the waist is a tad tight on me. I bought a pair in nutmeg and loved them. So I order a pair of black in the same color and they are waaaaay shorter. Pretty disappointed. 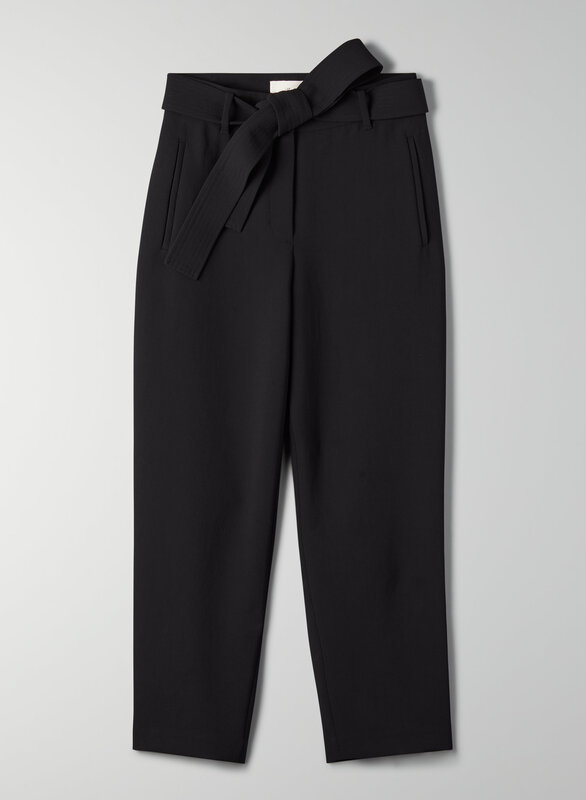 The cut and fit of this pant is exceptionally flattering and the bow is a nice touch. I would buy them in every colour if it made sense. Wear them all the time! I bought my Jallad pants just over a week ago. I wore them a couple of times and the seam came completely undone on the left leg. Very badly made, clearly. Love these pants, I'm 5'2" and 110 lbs and the 4 fits perfectly. I ordered modern brown and they look more black than brown to me but I like that. I also find that with a smaller waist the belt is a bit long, but that's my only real complaint. 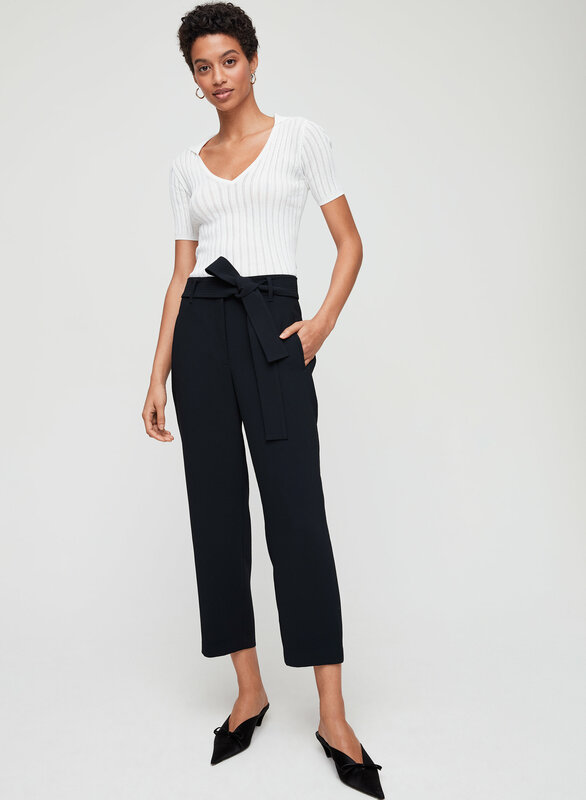 Very stylish, easy pant for work, hits exactly where I want at the waist. I love these pants for work. I get so many compliments. I have them in two colours. All my pants are size 12, assuming Aritzia Jallade Pant Crepe size 12 would fit me I bought it online and unfortunately they were too small. I went to a store for an exchange only to find out that 12 is the biggest size. I have these pants in 3 colours. They are so versatile! You can dress them up with a pair of heels or wear them more casually with sneakers. 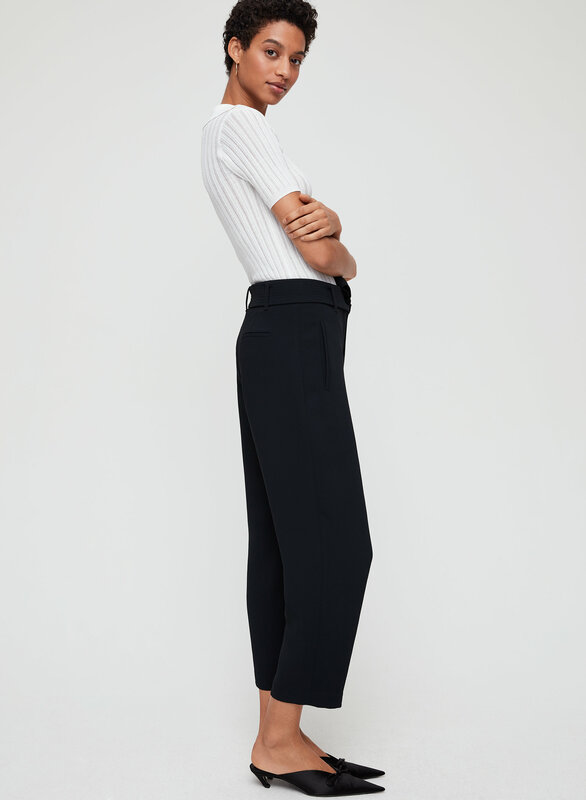 Love these simple yet elegant pants. The tie at the waist adds a little something extra to an otherwise plain pair of pants. The fabric is light and fluid and feels very luxe. One of my favourite pants from Aritzia! Love these pants so much! So easy to dress up or dress down and so flattering. To say these fit smaller is an understatement, the sizing on these pants is ridiculous. For the price point they're sold at, you'd expect them to be of higher quality but that's not at all how I would describe these. I love these pants, I bought two pairs in different colours, including a red/maroon colour perfect for fall. I love how flattering these pants are, but they do fit quite small. I went up 2 sizes from my regular which was hard to get over. Once you get past that though, you'll realize how amazing these pants are. The fabric seems to be high quality and they wear well (no creasing). Fun to wear with booties or heels. Recommend! These pants are incredible and so beautiful on, I highly recommend them! I'm normally a size 4 in all pants at Aritzia but I sized up to a 6 and they fit perfectly. Love the high rise and structure. It’s very comfortable and stylish. Bought in black. I sized up as my waist is non existent. But still very flattering. High waisted bow is very flattering. Material feels nice. These are a must. Beautiful crafted and can be worn many different ways. The high rise is just the right amount of high. These pants are complimentary of my curves... and I get just that in these pants, many compliments. The belt alone creates a nice amount of versatility because I sometimes take the belt out when paired with a wrap top that has it's own belt/tie. Mostly I keep the belt in as it adds a level of uniqueness. I have both the ludlow colour as well as the black and I wear the black the most (which I bought on a total whim with zero regrets). To boot, they're very comfortable. A classic pant. Can be paired with heels or flats. Pants had great reviews but they were super high waisted and compared to the Cohen just not as flattering on my body type. I’m short and have some curves. I love these pants they are comfortable enough to wear casual or dress up. Nice fit, soft fabric , drapes nicely. Love the fit and material! This is my fav pants from Aritzia and I’ve bought 3 pairs so far! Highly recommended to anyone! I really like the style. I’m not really good with tieing the knot though. These pants have become a new staple in my wardrobe! The high rise is super flattering. They’re super comfortable and look very sleek. Much much bigger than typical 0. Love the fabric and the cut of these pants - great for everyday wear or more formal occasions, with flats or heels, etc. They're also very comfortable to sit in. Love the shape of the leg. A little slim in the waist - took a larger size than anticipated. I'm in love with these pants. The cut and fit are so flattering. I usually wear an 8 in Babaton pants, but I found Wilfred pants fit smaller and needed to go with a 12. I LOVE these pants - I have them in 2 colours and where them ALL the time. Perfect for the office or dress down for casual wear. fits small! i wear a XXS in tops and 00 or 0 in pants and i'm a solid 2 in these! Love these. They are a great work pant. But they fit so much smaller than what the photo looks like (on the model who is the same size as me). Wish they were slightly looser. Also not as black as I thought they would be. But the colour range that they come in is pretty awesome. Would reccomend to a friend but wouldn’t know what size she should go with. Such a flattering pant: love the high rise! I’ve worn it with the fabric belt it comes with & with my Gucci belt and both ways look great. The most flattering pants I own. They also easily dress up an outfit. Perfect for both work and drinks. I like to wear these with a skinny belt or with the fabric belt that comes with the pant. Flattering fabric, it does not wrinkle. I had to order a size up, runs small. I absolutely love these pants! Extremely flattering and comfortable. I sometimes wear it with a tucked in t-shirt and it looks dressed up, but effortless. I will probably purchase in another color. I had to size up to a 4 (usually a 2 in most Aritiza pants), since they are very high waisted. I didn't want them to be too tight on my stomach.